Whether to pursue an associate’s degree or a bachelor’s degree is a highly personal decision based on a variety of factors. Here are the top five differences between the two degrees to consider as you contemplate your options. The most basic difference is the amount of time it takes to earn the degree. A full-time student can earn an associate’s degree in two years or a bachelor’s degree in four years. Part-time students take longer to earn each degree, but generally, an associate’s degree will be faster to get than a bachelor’s degree. Note: Often credits earned in an associate’s degree program will transfer to a bachelor’s degree program. So if you already have an associate’s degree, check with your school’s credit transfer policies to see if you can fast-track your bachelor’s degree and finish it up in just two years instead of four. The exact cost per credit will vary from school to school, but generally, an associate’s degree will be less expensive than a bachelor’s degree. This is largely due to a shorter time investment, but many schools that offer associate’s degrees are less expensive than those that offer bachelor’s degrees. There are two approaches to getting an associate’s degree. One is to prepare for a career in a specific field by enrolling in a highly-skilled vocational or technical program, like nursing or culinary arts. The other is a general studies approach which allows you to earn transfer credits and an associate’s degree simultaneously. This type of associate’s degree doesn’t require a major (specific field of focus). Most bachelor’s degree programs require that you choose a major and complete a final project. But before you get to coursework in your major, you’ll need to complete about two years of general education. (That’s where an associate’s degree can come in handy.) Bachelor’s programs also allow you to explore elective studies, which can be formed into a minor that complements your major. Looking for an educational experience that’s flexible and convenient? Eight reasons adults are choosing online education. If you want to begin your career quickly in a technical or skilled-labor industry, an associate’s degree is all you need to get started. Jobs you can get with an associate’s degree include dental assistant, licensed practical nurse (LPN), cosmetologist, computer programmer, and more. While there are many careers that only require an associate’s degree, you may be competing for jobs with candidates who have bachelor’s degrees. Generally speaking, an applicant with a bachelor’s degree may be thought of as more qualified or more attractive to employers. Fields like accounting, finance, and business management often require a bachelor’s degree at a minimum. These jobs typically offer more opportunities for career advancement and promotion. Depending on the position, some companies don’t care what your particular area of study was; just having a four-year degree meets their requirement. Of course, seeking a career related to your major has its advantages. A bachelor’s degree is a must if you’re interested in a career that requires graduate study. You’ll need to have your bachelor’s degree to apply for master’s- or doctoral-level programs. 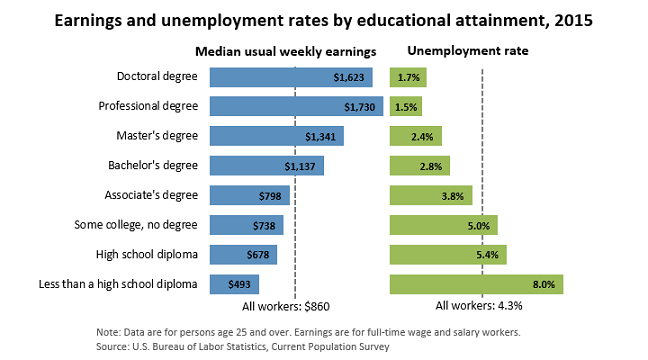 According to the Bureau of Labor Statistics, people who have a bachelor’s degree earn more and are less likely to be unemployed than those with an associate’s degree. 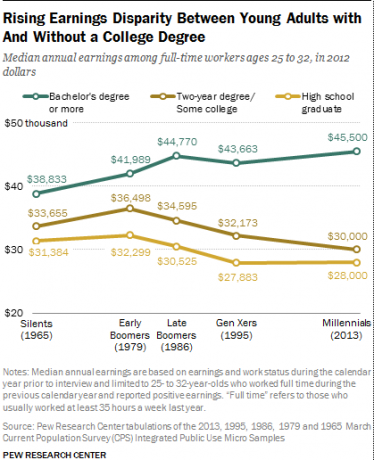 And the earnings gap between degrees is widening with each new generation, according to findings from a 2014 Pew Research study. Explore Capella University’s online bachelor’s degree programs. Want to know what tablets work best for online classes? Find out what’s working for Capella University students. Accreditation is an important factor to look for when choosing a college. Is a Master’s Degree Right for Me? Get the career info you need, before you need it. Send it my way. Get the career info you need, before you need it.